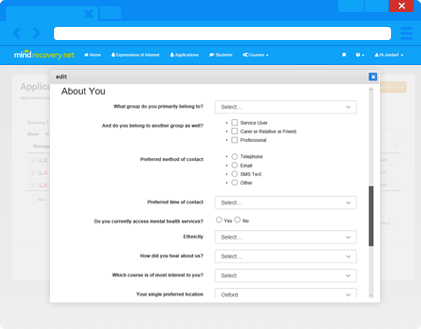 Mindrecoverynet.org.uk is a customer relationship management (CRM) software crafted to help Mental Health Recovery Colleges and training providers manage their applications, students, courses, tutors, course schedule, venues, bookings, attendance and impact and outcome assessment. Search for mental health recovery colleges or training providers that cover your area. If you want to suggest or recommend a college or provider to be listed here then send us their details here. Have confidence that your information is being sent securely, directly to the provider you choose. Share with others that are going through the same thing and become a Tutor. Mental Health Recovery Colleges are committed to co-creation and co-development of courses. Free search results listing, or subscribe on a monthly or annual basis to use Mind Recovery Net software to manage your short course provision. 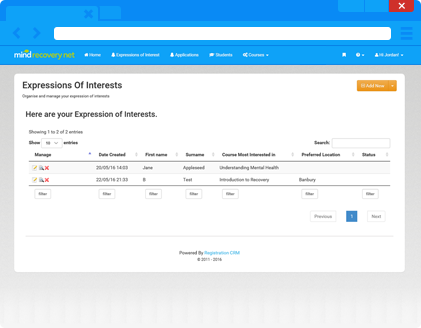 Your own customisable “Expression of Interest” form on your website, that is connected to your website but sends information to the mindrecoverynet software automatically. Your learners WON’T have to navigate away from your website to start their learning journey with you! Add any questions that will help you assess whether you are the right organisation for your user group. You can add expression of interest forms directly and convert the enquiry into an application. Review submitted Expression of Interest Forms all in one place, and add detail to the applicants profile as you learn more about them. See all the things you can do with an Application here. 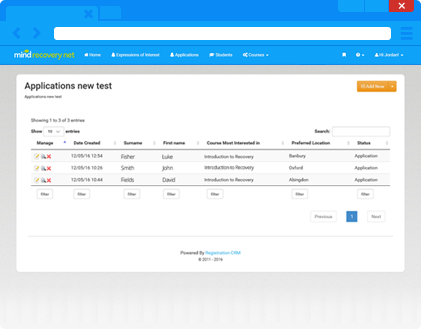 Make that information available to your team that assess applications. You can also add applications directly into the platform. Manage your interviews, individual learning plans, personal learning goal setting and induction checklist. Send templated letters and emails through the system quickly and easily. 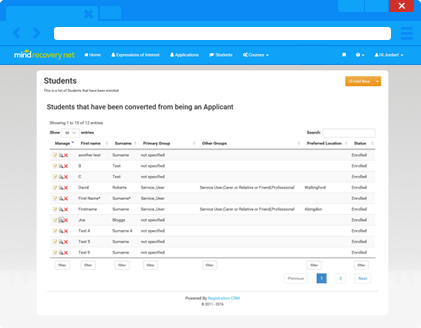 See all information relating to recruitment and induction, and be able to book students onto courses quickly and easily, add Tasks, upload documents for keeping and sharing with your team, track communication, send emails directly from the system, mail merge to document templates, add contact details and next of kin and emergency contact details. NEW for 2017 – Embed a list of Courses that you run on your own website with you own secure data feed. NEW for 2017 – Embed a list of Scheduled Courses that you run on your own website with you own secure data feed.